Despite our allies’ warnings, Ottawa isn’t taking the threat of authoritarian China seriously, writes J. Michael Cole. For many years, experts warned that China would threaten the system and values that define Western civilization. Analysts in Taiwan, Hong Kong and a handful of democracies on China’s peripheries, as well as a number of intelligence agencies worldwide, saw signs—especially after Chinese President Xi Jinping came to power—that China’s longstanding strategy of “lying low” was coming to an end. Beijing was now keen to challenge the rules of the game. Indeed, China was already at it, using various techniques that are now making headlines in the West. 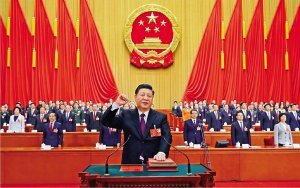 Xi himself, in addressing the Party Congress, has put much greater emphasis on, and markedly increased the capabilities of, the United Front to facilitate China’s expansionist, and now nearly global, ambitions. But we were being Cassandras, critics countered. The popular view was that engagement and, indeed, willful ignorance of the Chinese Communist Party’s starkly different worldview would eventually make China become more like us—liberal, rule-abiding, and perhaps democratic. Worse, our cautions were ascribed to a Cold War mentality, or we were being “anti-China”—racist, even. Today, we know those attitudes have been instrumental in helping China develop its economy and lift millions of people out of poverty. But those same attitudes have also allowed the Chinese Communist Party to avoid modernizing in line with Western ideals. Instead, the most successful communist party in world history has ramped up a Chinese nationalism that has reached an alarming pitch. Meanwhile, it has tightened its controls on all aspects of Chinese society, cracking down on dissidents, the press and intellectuals, threatening democratic Taiwan, breaking promises over Hong Kong, and launching a disturbing “thought reform” campaign against the Uighurs in Xinjiang. While his predecessors wisely opted not to defy the international system, Xi has overturned that policy, sensing an opportunity to use China’s new influence and economic might to refashion the world order to better suit its ambitions, and reacting to perceived weakness in the democratic world following the 2008 financial crisis, the election of Donald Trump, and Brexit. The Chinese government realized its money went further in undemocratic countries that needed infrastructure investment and whose leaders were looking for alternatives to the IMF and World Bank, and so the “China model” took off across Africa, Southeast Asia, and elsewhere, growing China’s influence in those countries one project at a time. We’ve even begun to see censorship of any criticism about China in these African countries. However, that strategy can only go so far. It was one thing for China to conduct business with autocrats, but democracies impose rules around transparency and leadership changes that stood in the way of Beijing’s ambitions. To undermine the democratic firewall, Beijing needed a novel approach to circumventing those rules. In other words, the Party needed to change us—to make our societies more like China’s. For several years, China got away with it. It established various networks, threw money around, created dependencies with infrastructure investment, students, and tourism, gained influence within distracted international institutions such as the UN and its affiliated agencies, and co-opted officials, intellectuals and businesspeople. While officials from targeted countries believed they were interacting with ordinary Chinese firms, officials, journalists, and representatives—and most were, indeed, normal—little attention was paid to possible connections to the Chinese security apparatus, the Party’s United Front Work system, or to the pervasive ideology that underpinned their activities. Gradually, China developed a constellation of media, chambers of commerce, businesses, think tanks, cultural associations and other entities that could co-opt, intimidate, confuse, and distract our officials, intellectuals, business leaders, and the Chinese diaspora. Unbeknownst to many, China’s political warfare and influence operations created boosters in Western academia, silenced critics of the Party, and helped the Chinese military, often through front companies, to acquire technology it needed to modernize its forces, which now threaten stability across the Indo-Pacific. Revelations of odious Chinese penetration in Australia, New Zealand, the Czech Republic and elsewhere in recent years have sparked an awakening that was long overdue. We’ve come to realize that the threat of authoritarian China is a fact of global affairs. And even as we negotiate trade deals and our businesses look to China as an alluring market, our societies need to weigh the benefits of continued business-as-usual engagement against the costs to the democratic values we cherish. Through various initiatives, the United States is now leading the charge by assembling like-minded democracies that desire a concerted response to the challenge posed by China. Within the Western intelligence community, Huawei’s long-suspected ties to the Chinese military, and the likelihood that the firm could install “backdoors” in its telecommunication systems, has been a longstanding concern, especially as the firm has proposed itself as the sole provider capable of installing 5G networks in various countries. Critical infrastructure, such as communication networks, should not be open to firms which we know are affiliated with hostile forces. Canada’s decision to forge ahead with Huawei appears to ignore the advice of both allies’ intelligence agencies and its own. A bipartisan letter from two U.S. senators, as well as separate warnings from the former heads of CSIS and CSE, called on the Canadian government to reconsider including Huawei in Canada’s 5G infrastructure. America and Australia have already banned the firm from their own 5G projects because of security concerns. Even as the Canadian government ignores many of the warnings and recommendations made by its intelligence analysts and allies, China continues to acquire Canadian firms involved in sensitive sectors. Perceptions that Ottawa isn’t paying sufficient attention to these, and to China’s “sharp power” in general, risk undermining trust in Canada’s reliability as a member of the “Five Eyes” intelligence grouping; the same threat has faced New Zealand, another member, in the past year. We should not forget that breaking the bonds that unite us is also part of Beijing’s strategy, all with the aim of weakening the U.S.-led liberal-democratic world order. Ottawa risks turning Canada into the weak link in that alliance of democracies. And so we are at a crossroads: we must decide whether we want to be in the democratic camp or to side with those, most of them undemocratic, that are bandwagoning with a revisionist regime that threatens the values and traditions that make our world safer. We have to decide if markets and money are less important the upholding of our democratic rights—and those who would threaten to undermine them. We have to decide if we should trust integral infrastructure with a company that intelligence from our own agencies and our allies says to be wary about. Making the wrong choice could be disastrous. J. Michael Cole is a Taipei-based security expert and a former analyst with the Canadian Security Intelligence Service in Ottawa. He is the author of the report 'The Hard Edge of Sharp Power: Understanding China’s Influence Operations Abroad,' released in October by the Macdonald-Laurier Institute.